Bionic Commando: Rearmed looks sweet as hell. Seriously, I don’t understand why there aren’t more 2D side scrolling games released on the latest consoles. Once everything hit 3D, it’s like there was no real going back. Imagine how cool a 2D Castlevania, Mario, or Sonic game would look if they did something like this on a current gen system. But no…it’s like most companies have relegated 2D to handhelds. I think way more people are excited about Rearmed then the 3D one. 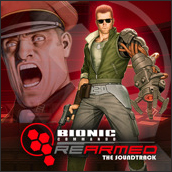 I don’t even know what the 3D Bionic Commando remake is called, because I don’t even care. I know it won’t be as sweet as Rearmed, especially with the two player co-op. Bionic Commando for the NES is basically totally awesome. The Japanese version placed the character in a battle against futuristic Nazis. The final boss was Adolf Hitler, who had been resurrected by evil scientists. Unfortunately, the U.S. version had all of that removed, but it was still a fun game. I remember playing this a lot as a kid and loving it.